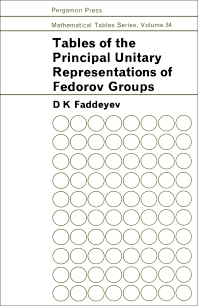 Tables of the Principal Unitary Representations of Fedorov Groups contains tables of all the principal representations of Fedorov groups from which all irreducible unitary representations can be obtained with the help of some standard operations. The work originated at a seminar on mathematical crystallography held in 1952-1953 at the Faculty of Mathematics and Mechanics of the Leningrad State University. The book is divided into two parts. The first part discusses the relation between the theory of representations and the generalized Fedorov groups in Shubnikov's sense. It shows that all unidimensional representations of Fedorov groups are basic, and hence are given in the tables. In particular, all representations defining generalized Fedorov groups are given in the tables. However, it should be noted that the same generalized Fedorov group may correspond to different representations, if the latter cross each other in certain automorphisms of the Fedorov group to be represented. The second part contains the tables of the principal unitary representations of Fedorov groups.